Sixteen passengers were injured in the emergency evacuation of a Boeing 737-800 at Glasgow, UK, in October 2012. The AAIB investigation revealed several evacuation difficulties. 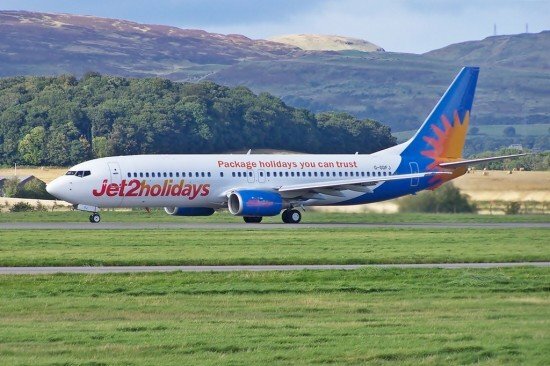 On October 19, 2012 a Jet2 Boeing 737-800 was scheduled to operate a flight from Glasgow, UK to Alicante, Spain. There were 187 passengers and six crew members on board. As the aircraft commenced its takeoff roll, both pilots commented on a strange smell. A few seconds later, due to what appeared to be smoke in the cabin, the Cabin Service Director (CSD) alerted the flight crew to an emergency situation. The takeoff was abandoned and the aircraft stopped on the runway. Visual inspection by the commander confirmed the appearance of a significant amount of smoke in the cabin. He ordered an immediate evacuation. was difficult to see the ground in the dark and some passengers were not aware that they should slide down the flap surfaces. Others expected to find an escape slide. On the left wing, some passengers slid down onto the ground and assisted others. On the right wing, fewer people slid down to the ground, while others re-entered the cabin and exited it using door escape slides when it was apparent that there were no visible signs of danger. Passengers evacuating through the doors jumped onto the slides, as instructed, and, given the wet surface, slid rapidly to the bottom. Some people had difficulty clearing the slides before the next passenger arrived. This caused a number of injuries, as people collided or were knocked over onto the ground. The evacuation took an estimated 3 minutes and 38 seconds. A total of sixteen passengers were injured as a result of the evacuation, due to passengers bumping into each other on the slides or being knocked to the ground. No source for the smoke was identified but excessive moisture in the air conditioning system was identified as a possible factor. The operator subsequently amended its maintenance procedures.